Last night after being awarded the Dai Shihan with my friends Jack, and Par, we were asked to teach. When sensei gives you a new diploma, you are often asked to demonstrate, and you always feel more lost than ever (if possible). Tuesday night was no exception. Whatever movement the three of us would do, Sensei would turn them into something impossible to reproduce. At first, I thought about 中途半端 (chûto hanpa) some “half cooked technique”, but then I understood that it was more than that as sensei didn’t even try to do a technique. His uke would be stuck in mid-air as if unable to move or to continue his attacks, and sensei was hardly touching them. As this has been the case for the last week of training, Sensei used no force, no speed, and nearly no contact. Uke was fighting gravity and only sensei’s presence, and the little contact us the only thing preventing from falling. He spoke again of 中心 (chûshin), the axis. When you look at the kanji you see “center” and “heart”. Sensei is standing at the center of everything. But as 心 Kokoro is also the mind for the Japanese, we can say that sensei is inside uke’s mind. Whatever the attack sensei was placed in a position where he was enslaving uke on himself. Uke’s body was the axis around which sensei’s actions were turning. Sensei added that we have to move at the unconscious level. Meaning that our body moves slowly by itself and adjust to uke’s balance by creating an ever shifting axis. Uke being out in a situation where his first priority is to stay up has no more willingness to pursue his attacks. Being able to activate this unconscious toute of movement – or to deactivate it – is what his Budô is. Juan Manuel Serrano was my partner during training and because of his high level we could really try our best to do what sensei was demonstrating. Juanma is not only a high level Jûgodan but also a sixth dan in jûdô. This means that taking his balance is not an easy task. The class went by very fast as the both of us were training intensely. 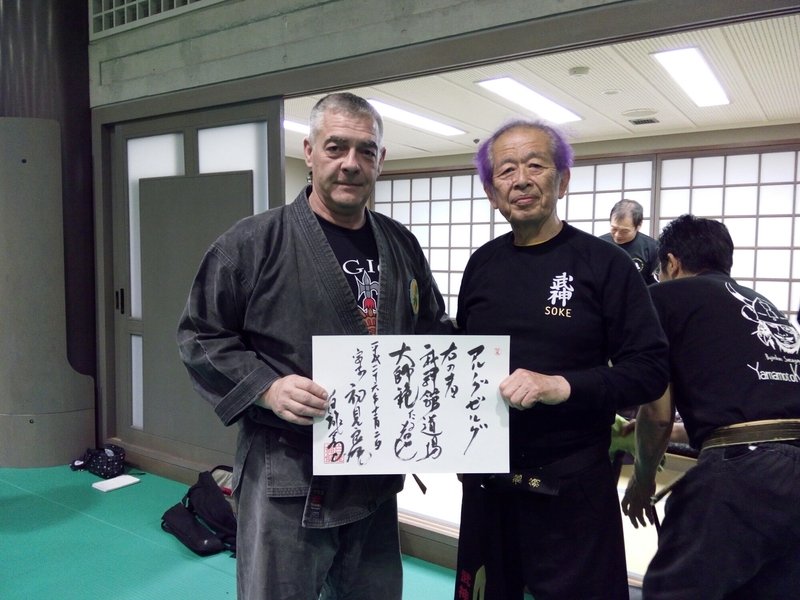 As this is one of my last post for this 55th trip (there is another article coming about the last class I had with Nagato sensei today), I beg you to understand the importance of coming and training here in Japan. Many Bujinkan teachers came here once, and behave as if they knew everything after that. This is wrong. Let me be clear here: this is not the movie “the matrix” where chosing between the blue pill and the red pill will do the job for you. We don’t have a plug behind the neck to download the Budô feeling. It is by training here often, that, little by little, you can absorb these 神技 (kami waza), these “divine techniques”. It is not important if you feel lost and don’t get it. As sensei put it last night: “it is not important that you get it or not, the important is that you train it”. This is the “keep going” that matters. The art of Hatsumi sensei transcends our human nature and makes us better human beings. This is what his Bujinkan is about. So next time you are here please forget your certitudes, and be ready to ride on the path of the martial winds of of the Warriors of Budô.